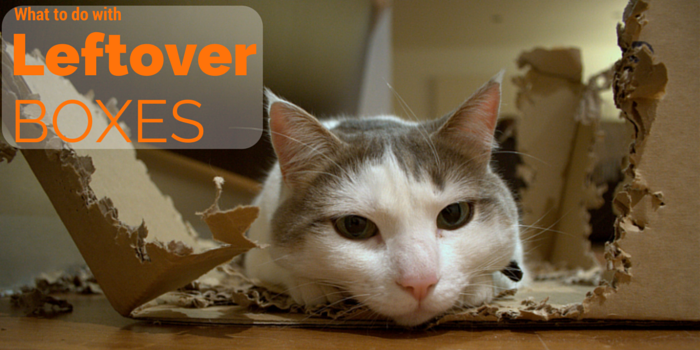 Figuring out what to do with your leftover boxes can be frustrating. The first thing that comes to mind is to put them out for the recycling collection, but if recycling isn’t for a few days or if your recycling is picked up bi- weekly then they could be invading the space in your home for longer than you are comfortable with. Here are a few ideas on what you can do with those space-sucking boxes. People who are planning to move are always looking for new boxes. Try finding a local Facebook page or message board to let people in your community know that you have a surplus of boxes to get rid of. People who are moving or know someone who are moving will jump on the opportunity to grab a lot of boxes from one source rather than going from store to store asking for their spare boxes or worse having to buy them. You will be surprised how fast they will go. If you’ve just moved house, then chances are you’ll have moved a lot of stuff that doesn’t necessarily have a place in your new home. If you’ve made the (very sensible) decision to store some items, then why not consider storing some spare boxes too. You never know when they’ll come in handy. If you’re feeling crafty there is a ton of ways to find a new use for your left over boxes. Maybe the kids need a disposable playhouse or a box maze in the playroom, or think forward to Halloween and help your son or daughter to create the coolest robot costume ever! Include the little ones in your repurposing project and make a craft day out of it. When it’s time to colour their brilliant box creations take some time for yourself, or if there is still unpacking and house settling to do then take this time to do it. Is Christmas or a special birthday around the corner? Why waste your money on gift boxes if you have a mountain of unused boxes to get rid of? Some wrapping paper, scissors and tape will transform your unused boxes into practically free gift boxes! Websites like Pinterest have a lot of unique and fun ideas on what you can do with your unused boxes. If you decided to treat your new home to new furniture then the last thing you want is the delivery man scratching up your new floors and freshly painted walls with your new stove and sofa. Laying your boxes flat on the floor as well as leaning against your new walls will protect your floors and walls from any potential damage. All in all, there’s a whole host of uses for those handy cardboard boxes, so make sure you don’t simply throw them away!